Le Meridien Hotel and Spa is a luxury hotel situated in the idyllic town of St Julian’s, on the north coast of Malta. With spacious rooms and a range of facilities on offer, Le Meridien St Julian’s is the perfect place for you to indulge and truly relax while on holiday. When it comes to accommodation, Le Meridien St Julian’s Hotel and Spa really excels. Guests can choose between a total of 4 styles of room all of which are fully equipped with a huge bathroom featuring a corner bath and rain shower, 40 inch led TV, high speed wi-fi and a large private balcony. Depending on your choice of room you can opt for a sea or town view from your balcony. And of course, all the daily amenities of a luxury hotel including daily house-keeping, bathrobe and slippers and air conditioning. For a truly luxury stay, why not try the executive rooms, located on the top floor of the hotel. 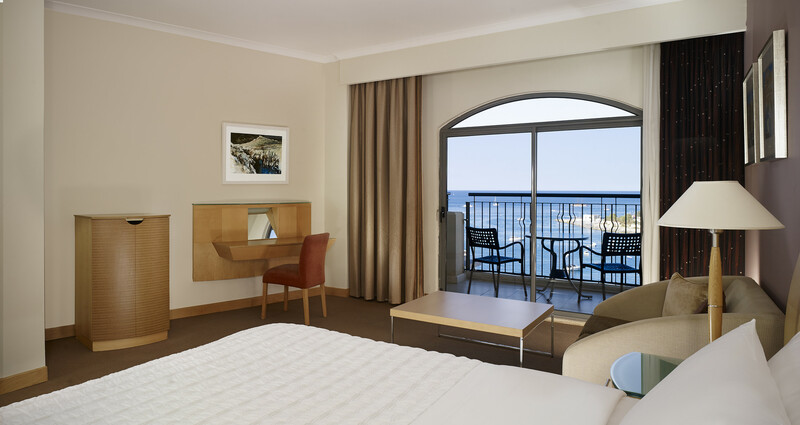 These large rooms offer the best views of the Balluta Bay from their balconies, all of which face onto the sea. Watch the sunset over the Mediterranean from your balcony while you eat, with the option of 24-hour room service and an in-room dining option. As an executive guest, you will gain full access to the Executive lounge where you will be looked after by an executive host. The lounge provides guests with breakfast in the morning as well as snacks and drinks throughout the day. It is also a very pleasant area to relax and take in the surrounding vistas. For the complete luxury experience spend a day relaxing in the hotel spa. Fully equipped for a full day of pampering, hotel guests have free access to the spa. Surrounded by large, white pillars, the deluxe heated pool emulates the style of a grand Roman bath. Completely unwind with a treatment in the peaceful treatment room while an onsite spa concierge creates a tailor-made treatment programme especially suited to your preferences. A serene environment, the spa at Le Meridien St Julian’s is a beautiful facility that creates a perfectly calm ambience where you can relax and unwind. As well as the heated pool in the spa complex, Le Meridien St Julian’s Hotel and Spa also has a stunning roof top pool, with views across Balluta Bay and on to the Mediterranean. This is the perfect place to lean back and forget your worries. As well as the two full sized pools, there is a shallow splash pool for children. If you like to stay active while on holiday, head down to the hotel gym which is fully equipped with a vast range of machines and equipment on offer. Alternatively, why not have a game of squash at the onsite court. For further information on the luxury facilities available to hotel guests, take a look under the facilities tab at the bottom of the hotel’s home page. With a choice of restaurants to choose from, as well as inviting bars, you will never need to leave the hotel to find good food. Take a trip around the culinary world with a variety of themed international nights in the Scirocco restaurant. Exquisitely cooked by highly qualified chefs, these evening buffets are made from the best quality ingredients to create mouth-watering dishes. At Le Meridien St Julian’s they ensure they cater for all tasted at Le Meridien St Julian’s. Head to the KuDéTa Lounge & Bar and take advantage of the array of perfectly grilled meats as well as a fantastic buffet of western delights like pizza, burgers and ice-creams. Throughout the day snacks and refreshments can be found at the KuDéTa Lounge. If you enjoy a touch of luxury while on holiday, Le Meridien St Julian’s is the perfect place for you. With spacious, comfortable rooms and a fabulous range of deluxe activities, we guarantee you will leave feeling pampered and rejuvenated. With direct flights from a large number of British and Irish airports, we ensure even your journey is a luxury affair, without having to stopover or travel a great distance to catch your flight. If you would like further information on other luxury hotels in Malta and Gozo, do have a look at our range of 5 star hotels under the 5-star Hotel window here.